Surprise store visitors with free promo items and products with discounts. Draw customers' attention to your promotions using catchy banners and product labels. Clearly show customer benefits on the shopping cart page. Overwhelming majority of free gift receivers admit that they are more likely to buy products in a certain online store after getting a free gift. Therefore, when receiving free promo items customers get significantly satisfied and the effectiveness of your promo campaigns rises. This is an easy and very effective way to increase clients’ loyalty and prepare fertile ground for future revenue boost. Create tempting promotions with free gifts and discount products. Inform customers about promotions with popups and catchy banners. While customers tend to ignore irritating traditional ads, promotional products are much more difficult to miss. Unlike TV commercials or magazine ads, free product samples seem to be a more credible promotional tool allowing clients try items in real life. 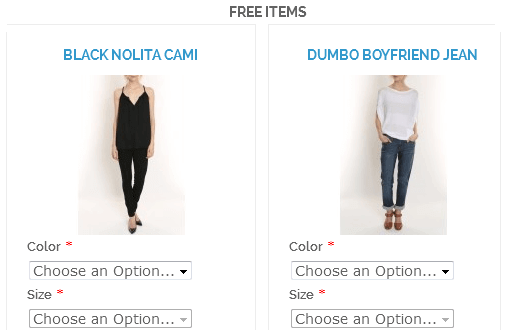 By creating catchy messages for free items visible on the cart page, you clearly indicate that customers get a FREE gift, which is obviously a nice surprise for them. 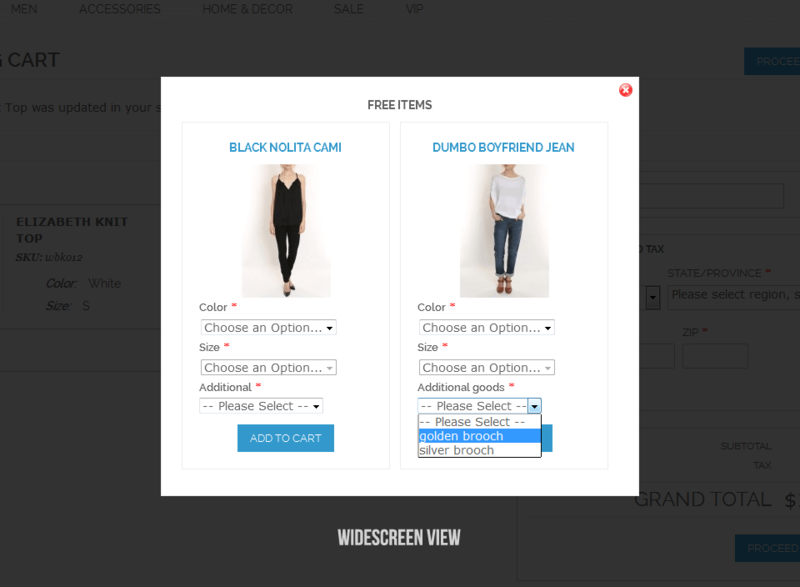 If you choose a configurable product as a free gift, customers will be able to select product attributes or required custom options which are displayed on a handy pop-up window in the cart. Besides, the extension supports bundle products. Admin is able to set up whether the promo items will shipped for free or not. This is vitally important in case of delivering heavy-weight or dimensional goods. All online merchants selling virtual products have a great chance to create tempting promotions with the Free Gift extension. The module fully supports virtual products enabling you offer them as free gifts. The extension is designed to be fully compatible with responsive Magento themes. It meets the requirements of widescreen, tablet and mobile view. 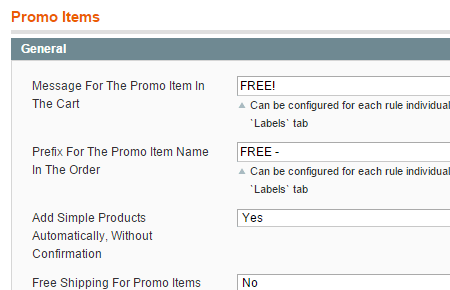 you can choose whether to automatically add all specified free items to cart or let customers select only one item. Software, e-books, images, music or video – any type of content that can be packaged into files and downloaded now can be offered to the customers as a free gift. 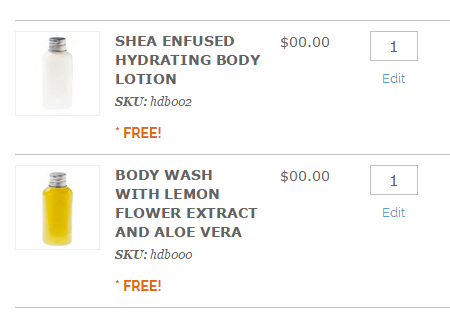 Now you can automatically add downloadable products to cart as free gifts without asking for customer confirmation. Easily enable/disable tax calculation for promo products that are offered with discounts to set tax policy according to your specific needs. 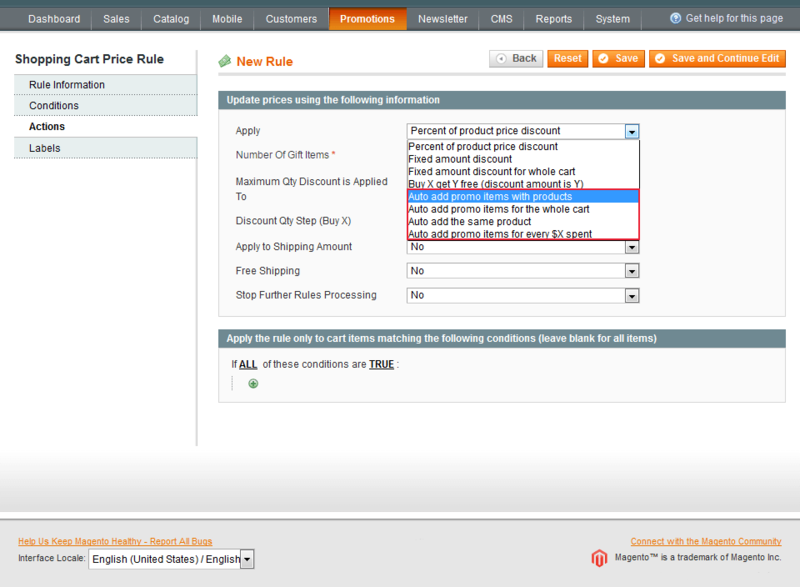 Now you can specify unoque promo items prefixes displayed for orders in the admin panel. 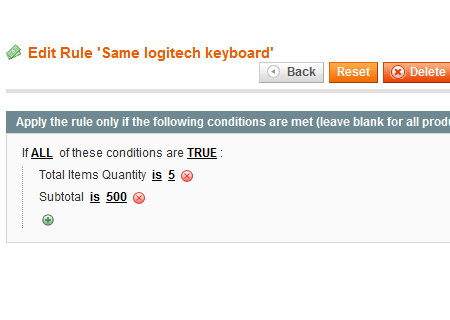 With the option you can create a separate prefix for each particular rule. Easily adjust flexible rules to your needs to promote new products by letting customers try them for free. 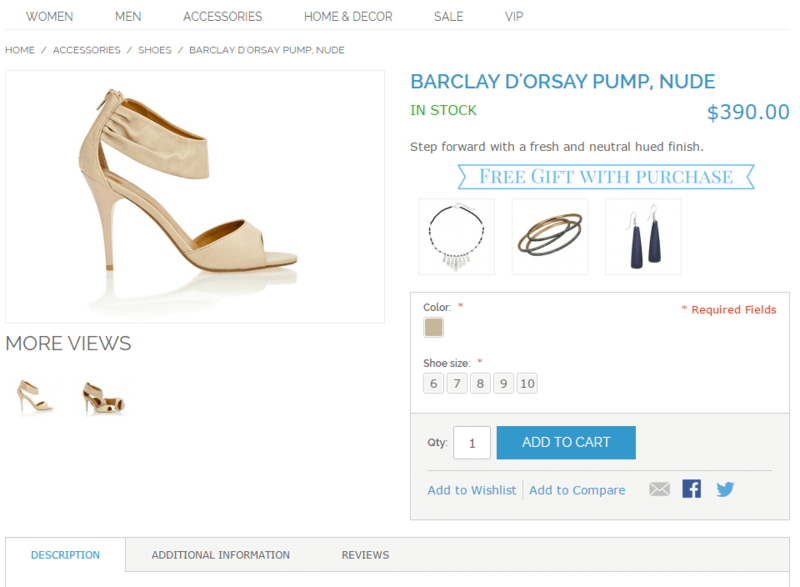 You can also raise popularity of certain products by automatically adding them to cart. This will help you effectively regulate the sales of particular products and unload your stock. 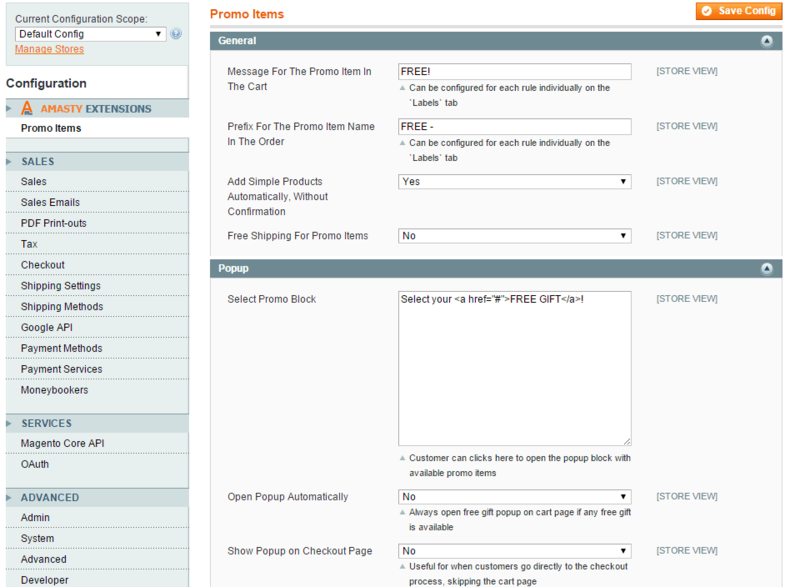 This Magento free gift extension allows you to provide clients with numerous gifts in one order. Create unlimited number of rules per shopping cart and amaze your clients with numerous free promo items automatically added to their carts in case customers meet the conditions of several promotions at once. Now you can offer not only free promo items, but the items with discounts as well. 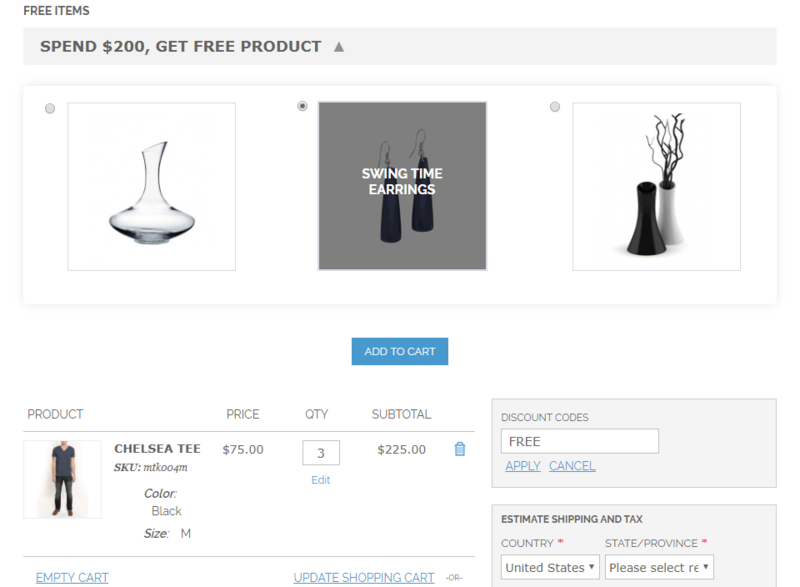 Flexible extension settings allow you to easily specify the discount type and amount and display both prices (original/special and promo price) on the shopping cart page and in the popup. The option allows you to offer free gifts to your customers not only at the Shopping Cart page but also during the checkout process. With this option you get an additional opportunity to give your customers a positive shopping experience and increase loyalty. 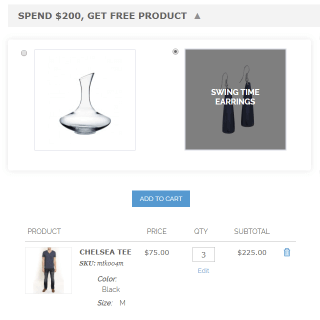 Automatically add gifts for every $X amount spent (For instance, you can set a rule so that a customer will get a free T-shirt for every $500 spent. 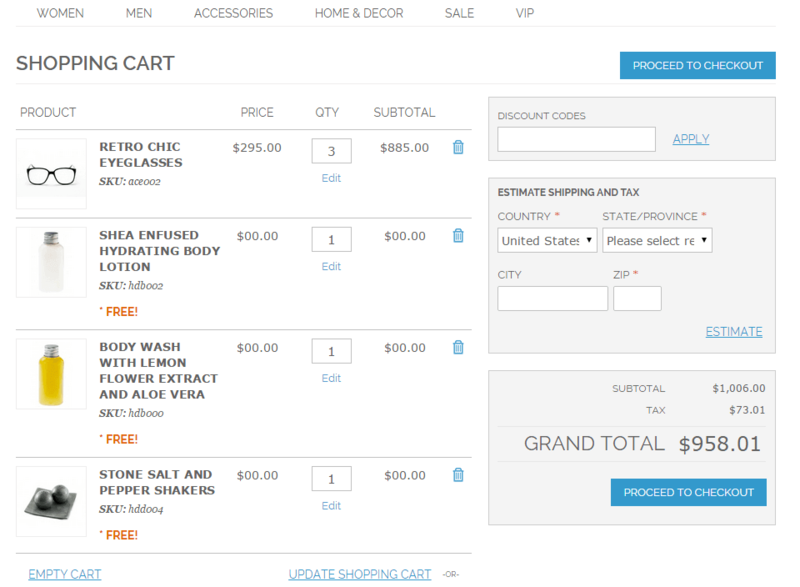 It means that if the cart subtotal equals to $1000 – the customer will get 2 T-shirts (one for each $500 spent). Some products may be used in promo rules and as a part of free gift conditions at the same time. 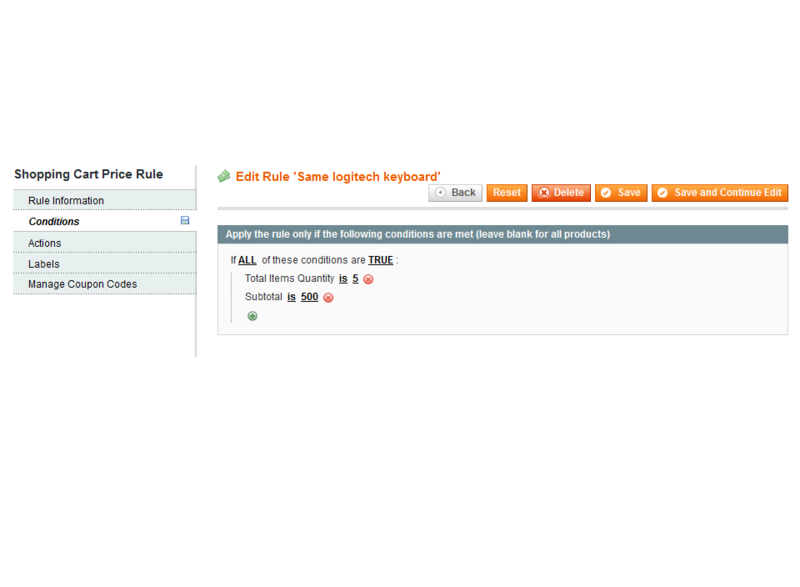 You can enable the option to apply only promo rules. For instance, according to a promo rule, customers buy a bag and get a mug for free. With the option enabled, if customers get a bag for free, they will not have a mug as a free gift. 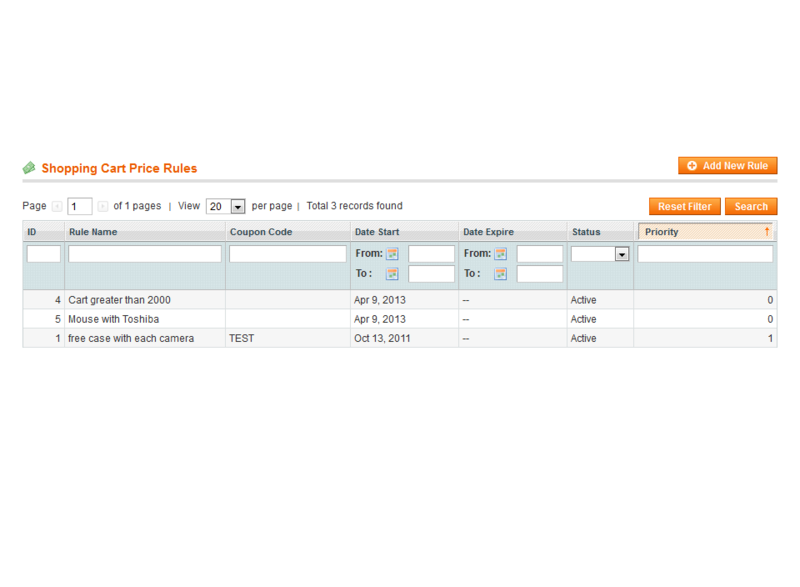 More detailed settings available for the rule “Auto add promo items for every $X spent”. For $X value, you can add taxes in calculations. You can also use your web store or base currency to calculate row subtotal. It is not a secret the magic power of the word ‘Free’ is great, and customers will rather choose to get a free 10$ gift than a 15$ discount. Thus, providing customers with free gift with purchse is not only beneficial for your brand awareness, but for your budget as well. Let your clients know what they should do in order to get a Magento free gift or an item with a discount. Now with the help of catchy banners and labels placed on product pages it will be impossible to miss any promo offer. If you have the Store Credit extension from Amasty, you can combine the functionality of both modules and present store credits as gifts for your customers. It’s a good way to increase clients’ loyalty and motivate them to return to your store for new purchases and pleasant bonuses. We brought up a few tips which might help you effortlessly handle the situations when a free gift is not added to cart automatically. Please click 'Read FULL answer' link below to learn more about it. I love this extension. I wanted to let my customers choose from a few free products as my shop caters for men and women, so they should be able to choose relevant gifts. The module worked awesome for this. However, I emailed support with a few suggestions and they answered me only a week later. I wish they did it faster. Little module - big deals! Customers do like discounts but free items they like even more that's true. We've just fall in love with this little module - just set the conditions and voila! Shoppers are happy to get free gifts we are happy to provide them with presents without any additional effort applied. Yep, customers have started buy more since we activated the plugin. We are totally satisfied with the results and hope to double our conversions by Christmas. Our customers were really amazed when noticed they could get more than one free promo item per shopping cart. This feature seems to really work, as the sales rate of products involved in promotional deals are rapidly growing! – New: we introduced a new action - 'Add gift with each N-th product in the cart' which allows you to add gifts automatically based on the product quantity in the cart. – Changed default style for gifts popup. Now popup is wider so more gifts can be displayed. – Fixed some JS errors. – Field renaming for better understanding of rule's setting. I.e. for some rules the setting "Discount Amount" is renamed to "Number of gift items". 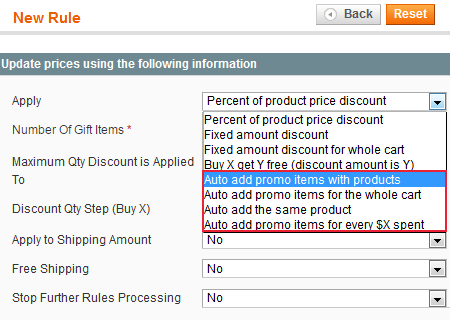 – Fix for Free gift was given with activated setting "Do not Offer Promos for Products with Special Price = Yes"
– Show reminder if gift is "out of stock"
– free gift is given for bundle product with special price and activated setting "Do not Offer Promos for Products with Special Price = Yes"
– Added ability to include/exclude tax, and calculation is now based on store/base currency for rule "Auto Add Promo Items for every $X spent"
– Now it is possible to add Store Credits as a gift, if the Amasty Store Credit extension is installed. – Option to show banners from all matched rules or show one banner only. – Fixed auto-adding gifts when customer removes main product from the cart multiple times. – New setting added. 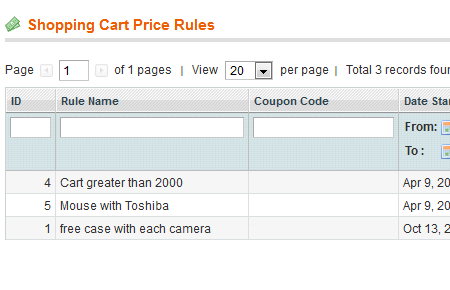 How to validate rules - for the current product only or for the whole shopping cart. – New setting "Show Popup on Checkout Page"
– Option to disable error notifications when you add main products to the cart, but there is no free gift available in the stock.